More than 40 million people go camping in the United States each year, but just because you want to “get away from it all” doesn’t mean you’ll have to leave behind all kinds of technology to do it. If you truly want to appreciate the outdoors, you’ll want to put away your smartphone, tablet, and laptop computer, but there’s no need to abandon all forms of modern technology. In fact, some gadgets and devices may enhance your experience—either by giving you more to appreciate about your surroundings or by giving you the tools you need to be successful. 1. A strong tent. 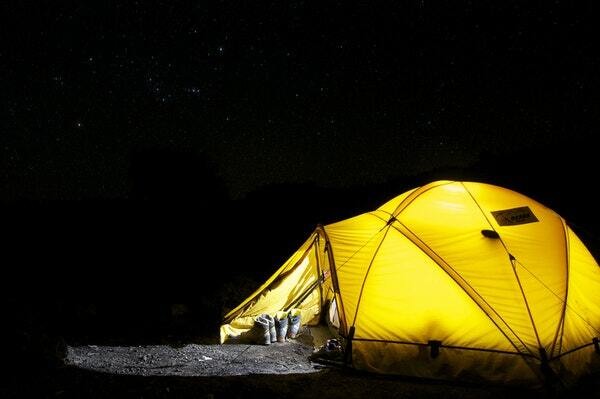 Sleeping in the middle of natural scenery can make you feel closer to nature than any other experience—but if you make the wrong tent investment, it could turn into an unpleasant experience, fast. When you buy a camping tent, you’ll want to keep in mind its size, its durability, and whether it was created for a specific kind of environment; for example, was this built to withstand heavy rain, or even snow? You’ll also want to get something that’s easy to set up, to make things as simple as possible. 2. A high-tech sleeping bag. Even seasoned campers find it difficult to get a good night’s sleep while sleeping on what is, essentially, the ground, but the right sleeping bag can make a world of difference. Look at the design of each bag, including the materials used for the interior and exterior, the availability of pockets, and the level of comfort you can expect from each model. 3. A power bank. Even if you plan on leaving your smartphone turned off for the majority of your camping trip, it’s a good idea to invest in a power bank, so you can plug in and charge up in the event of an emergency. Having access to a map or phone, when you least suspect you’ll need it, can come in handy. 4. A LifeStraw. The LifeStraw is a relatively new gadget that allows you to drink water from practically any freshwater source. Utilizing the straw-shaped model, you can drink directly from a stream or pond, without worrying about microplastics, bacteria, or parasites. LifeStraw has a variety of other filtration products as well, including water bottles. 5. A digital camera. If you want to capture your most intimate moments in nature, you should bring along a dedicated digital camera. You’ll get much higher-quality photos than you could take with a smartphone, and you’ll stop the temptation of using your smartphone for other, more distracting purposes, too. 6. The BioLite CampStove. The BioLite CampStove is a product that allows you to cook meals and boil water using wood you find in your surroundings. As an added bonus, the gadget converts some of the energy you produce by burning those materials into usable electricity, which you can use to charge your devices. 7. A solar shower. Solar showers are portable showering units that rely on the sun’s energy to heat water for your bathing needs. If you plan on camping for more than a day or two, it’s a must-have; there are several brands and varieties on the market. 8. Strong LEDs. You’ll also want to bring along a handful of LED lights, which you can use to illuminate your campsite in the darkest nights. LEDs are compact and energy-efficient, so you won’t need to worry about replacing the bulbs anytime soon. 9. The CaliCase. The CaliCase is an entirely waterproof pouch for your smartphone or electronic device. If you plan on going swimming, kayaking, or participating in any other water-related activity, you’ll want to be sure to take it along. 10. A classic multi-tool. Though certainly not a new technology, make sure you bring along a classic multi-tool, complete with a knife, scissors, screwdriver, can opener, and other tools you might need in your journey. No matter what your camping goals are, you’ll probably be glad you got one. The better prepared you are for your camping trip, the fewer risks you’ll face. You may prefer a situation that separates you from technology entirely, but these simple items can keep you connected and improve your experience without interfering with the benefits of your trip. Technology keeps advancing for every conceivable use, so you can expect your next camping trip to be even more immersive.